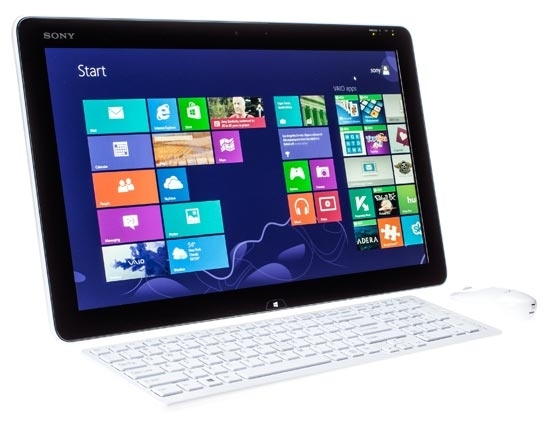 Sony officially released a new 20” tablet VAIO Tap 20 which was announced on the IFA 2012 in August. This device unites the functions of a monoblock and a tablet. Also, the device is positioned as a table intended for a home use, as it provides all members of your family with multimedia entertainment. Apart from 20” Multi-Touch screen which has 1600x900 pxls resolution and 16:9 side ratio. The device weighs about 5 kg, has a special stand that lets you to place the tablet into a vertical position, and a battery for autonomous work. The device runs under Windows 8. 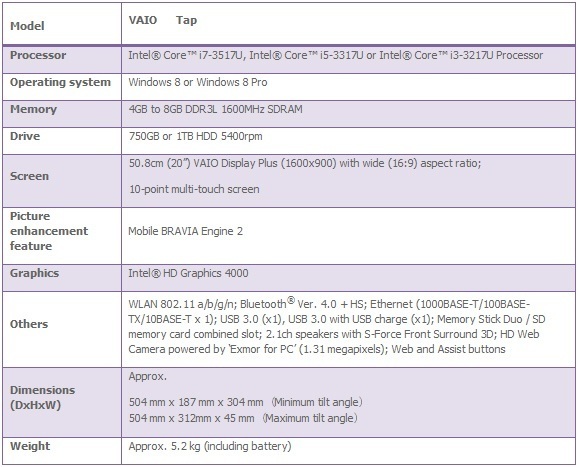 The main specifications of Sony VAIO Tap 20 are as follows: power efficient Intel processor (either Core i7-3517U, Core i5-3317U, or Core i3-3217U), HD Graphics 400 graphic card, 4/8 Gb of DDR3L 1600, and HDD 750 Gb or 1 Tb. Interface system includes Gigabit Ethernet connector, USB 3.0 and Memory Stick Duo slot. Also, this tablet has built-in 1.3Mp web camera with HD resolution and 2.1 audio system that supports three-dimensional sound. Thanks to the battery Tap 20 can be easily moved around the house (the battery lasts for about 2 hours, so that’s practically the only thing you can do in autonomous mode). You may use this tablet for family gaming, Internet surfing, watching movies, etc. You may place the tablet in a vertical position and use it as a monoblock – for gaming, surfing, etc. Wireless mouse and keyboard are supplied with the tablet. The tablet display supports quick sensor control and up to 10 points of contact thus allowing all family members to take part in different multiuser games. This new device is provided with 2.1-channel S-Force Front Surround 3D stereo speakers and built-in subwoofer. With the help of a One-Touch function a user may listen to music or look through the photos on other Sony devices that support NFC. In order to create a wireless connection between two devices you just need to put them together. And it’s worth mentioning that a user won’t need to set up Wi-Fi or Bluetooth. Tablet’s dimensions are 504x187x304 mm, weight – 5.2 kg including battery. Eugene Rudenko is a tech writer for IT company Intellectsoft. The company specializes in Android, iOS, Blackberry and WP development. You can also write for us by clicking here.